I’m a lover of all thing sports; and as such, I am excited about the Kentucky Derby tomorrow. I love the pageantry, the hats, the numerous stories of the horses, owners, trainers, and jockeys. There is so much tradition surrounding the day, including the drink of choice for the Derby, the Mint Julep. 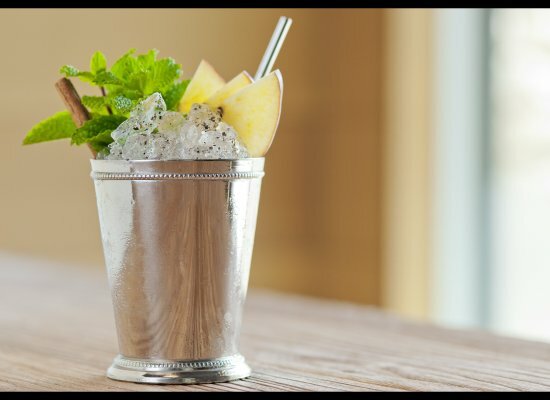 Served in a silver cup, and made with sugar, fresh mint and Kentucky Whiskey, the Mint Julep became the signature cocktail of Churchill Hill Downs in 1938. History has it that back then, a Mint Julep cost 75 cents; and today, $11.00. Rinse the mint to make sure any dirt splashed on the underside of the leaves is gone. Don’t dry them. The moisture from the rinse is helpful in making the drink. Put the leaves in a 12 ounce cocktail glass and pour the sugar on top. Muddle them together with a muddler or handle of a wooden spoon. When the leaves and wet sugar begin to turn to a mushy paste, add the water and the bourbon, and stir with a fork until the sugar dissolves. Top with crushed ice, garnish with the sprig of mint. Place your bets and serve! Yield: 1 (12 ounce) cocktail. Preparation time: 10 minutes. Start mixing by 4:30 for the 5:00 post time. « Pretty Face: Hello Gorgeous! Sounds like my new spring/summer cocktail. I love it. I just might wear a hat while sipping mine.